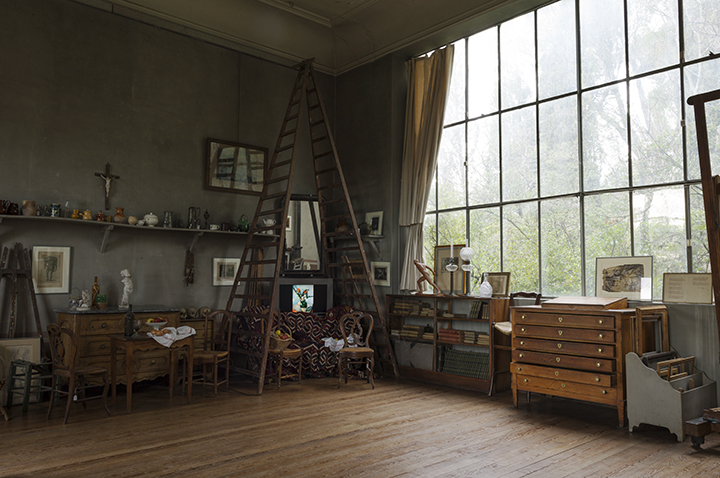 I walked into Cezanne’s studio in Aix-en-Provence and stood in awe of the space that he created for himself back in the 1890’s. Cezanne, I have always been in awe of. But to be in the real place, not some museum dramatization of his space, as is often the case these days, was to be in touch with whatever there was left of his spirit. And for me it appeared in the form of the grey color on the walls. Why grey?, especially with all that light (or maybe because of it?). Today almost every studio is white walled, like a museum white box exhibition space. So the grey fascinated me, and a number of other thoughts rose up about what grey did for him in his search for the flatness of paint on canvas as opposed to the illusion of deep space and perspective. He was giving all that up and it is why he is considered the father of modern painting, because to break with that long tradition of Renaissance perspective, in favor of marks on canvas, was a huge leap into the 20th century. 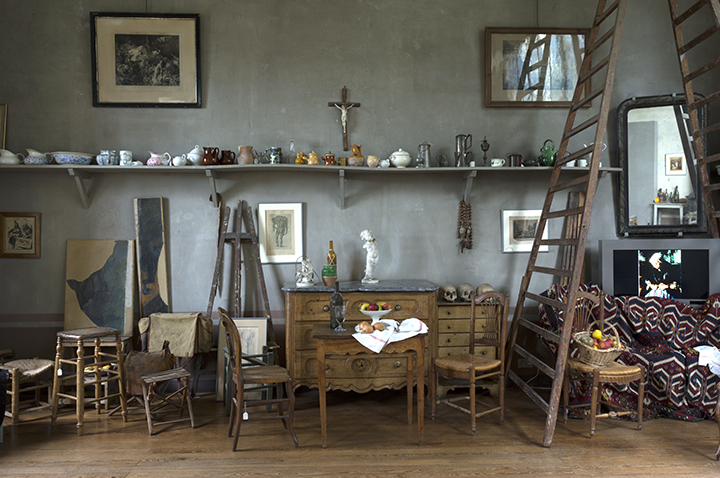 On the shelves above his painting table I noticed many of the objects that I have seen in his paintings, I asked the director if I could take them down and look at them against the grey wall and then to photograph them, in an effort to better understand his reasons for the grey. She told me no photographs were allowed, so I gently pushed her to check me out on the web and see my seriousness of purpose. Surprise! She let me have my way with the objects. Now, after 3 visits there, I have photographed more than 70 of his bottles, coffee pots, ink wells, cans, pitchers, cups, basins, decanters, wooden models, and assorted rubbish found in some of the drawers. Out of this study I have begun making still life grids with as many as 25 images in the grid. More about this another time, but for the moment we can look at Cezanne’s Hat. Which, when I put it on, came down over my ears! He must have had a huge head! 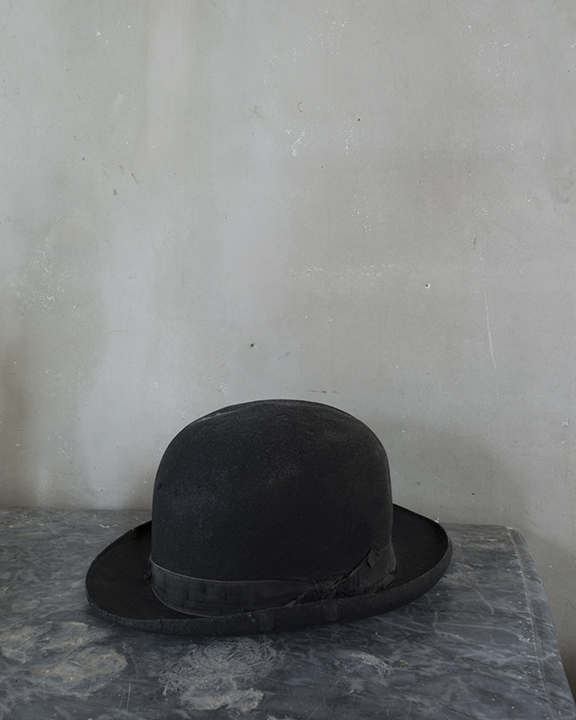 This entry was posted in Cezzane's studio and tagged Aix-en-Provence, Cezzane's studio, France, Interior, Provence, Still Life on January 31, 2015 by joelmeyerowitz2014. What a fabulous project Joel and the images you’ed created reflect that. Brilliant. Glad to see you and Maggie are livin’ large in a small French town.